Last Tuesday was the first episode of the 17th season of The Ultimate Fighter, with coaches Jon Jones and Chael Sonnen. When it was over, the Internet was buzzing with talk of the fight between Andy Enz and Uriah Hall. Alaska native Enz won’t be advancing into the TUF house, but his gutsy performance, despite a broken arm, put him on the radar of fight fans everywhere. The next episode of The Ultimate Fighter airs tonight at 9pm eastern on FX. 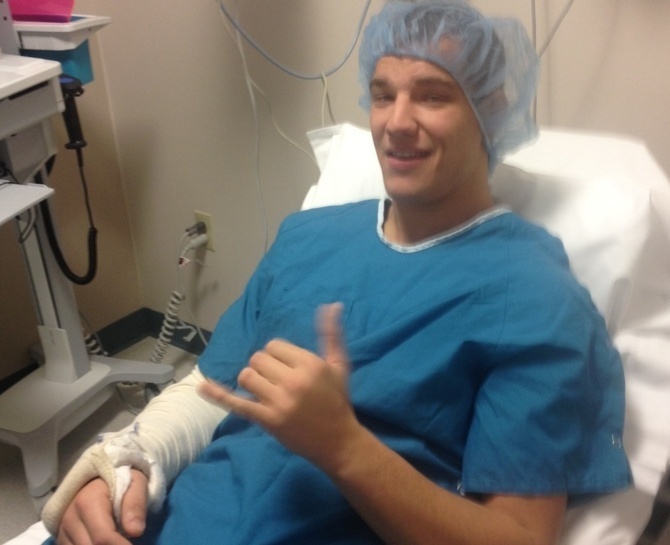 I knew 3 months ago that Andy Enz had gotten his arm broken on The Ultimate Fighter. I also knew that for contractual reasons, he wouldn’t be allowed to talk about it, so I didn’t ask what happened. I just assumed that in one of his fights on the show, he’d gotten caught in an armbar and refused to tap out because, well, that’s Andy. Everyone in Anchorage and half of Wasilla knows that. Andy was born in Anchorage and has been there all his life, which is fairly rare. It’s also been my home for the last 17 years. Alaska isn’t an easy place to live, by any sane person’s standards. Every year there are seven months of sub-Arctic winter, three of which pass in almost total darkness. The place isn’t known for typical American sports because we’re driven inside most of the year. But one thing that lends itself well to spending a lot of time indoors, and also to people who are a little crazy, is fighting. Andy started fighting professionally 3 years ago, when he was 18, and would have started sooner had the rules allowed it. He is the youngest person to ever win a championship belt in the AFC. On TUF, UFC President Dana White announced his record as 6-1, but that includes a tournament that isn’t supposed to count toward Andy’s pro record. Andy has actually never lost a pro fight. When they got to Las Vegas for tryouts, Andy walked into a room full of people that made him feel like a little kid. “There were 240 people there, and they all looked older than me, bigger than me, lots of scars and tats,” he says. “Maybe if I hadn’t shaved for a week, I could have grown in something that would look like a 5 o’clock shadow and I would have fit in a little better.” Had he not been used to being the kid in gyms all his life, this could have been intimidating. They handed him a pile of paperwork to fill out and then gave him a nametag with a number on it. They then broke everyone into three groups for grappling trials. Andy was in the last group, so he waited a long time before it was his turn. “It was so nerve-wracking,” Andy says. “There was a wrestling mat, a bunch of people standing around with clipboards and pens looking all official, Dana White and Lorenzo (Fertitta, UFC co-owner) were watching, and there was an FX camera pointed in my face.” He beat his opponent and was getting ready for striking trials when the fighters were then told that there wouldn’t be time because they had to get to the interview process. The fight was rough. Andy ate some nasty kicks and punches. At one point he slipped out of what looked like an unbreakable triangle choke to take Hall’s back. In the end he lost a unanimous decision to maybe the toughest guy in the house this year. I was so proud of him that it wasn’t until the show was over that I realized there had been no armbar that could have put Andy in the cast I’d seen him in. Soon after the episode aired, word started traveling around the Internet that Andy had gone straight to the hospital after the fight to get an x-ray done on his right arm. Early in the first round, right after he had broken free of Hall and stood up, Andy blocked a head kick with his right arm that resulted in a fractured Ulna, the bone on the outside of your arm, between your elbow and your pinky. The bone was shattered in four places; Andy got a plate and six screws put in his arm. Within hours of airing, the fight had become famous on the Internet, many saying it was the best in TUF history and Andy one of the toughest contestants the show had seen. White and TUF coaches Jon Jones and Chael Sonnen could be heard singing his praises. Sonnen even invited him out to his camp in Oregon to train. Knowing that Andy had broken his arm so early in the fight sheds a different light on the fight for me. Uriah Hall might still have won the fight, but what does it say about Andy that he fought 80% of that fight with a broken right arm? I asked him how he had pulled that off, and he said, “I just knew I couldn’t use it anymore, so I had to find a different game plan. That’s what I love about MMA; there’s always another way to go if your primary plan fails. It never entered my head to stop.” That didn’t address what I really wanted to know. What I meant was more like, “You do realize that normal humans don’t do things like that. How did you not only not keel right over in agony but rather continue using that arm throughout the fight?” He didn’t seem to get that I was reverently calling him something of a freak. I mean, my goodness.